This may be a crazy question, but here goes. Has anyone ever added a third AC unit to their Redwood, when we bought ours we were told two would be sufficient, but I guess they never spent any summer days in Florida or Nevada. Can this be done? I asked the dealer about this last fall when we picked ours up after having some work done. Some of the RW's are pre-wired for the third AC. Ours was not. So I don't know what kind of a job it would be to put one in. They also told me that even if you have three ACs you could only run two at the same time. Yea Greg, Jeff is correct............running 3 AC's on a dual 50 amp service is not possible. The new Redwoods with the 3 AC"s have a power management package to accomplish it. Even so, with most campgrounds, running two AC's with other high current devices in the coach is problematic. Most campgrounds don't have the capacity to deliver that amount of amperage, so the line voltage dips to very low levels. This is also worse in peak travel season when campgrounds are full. 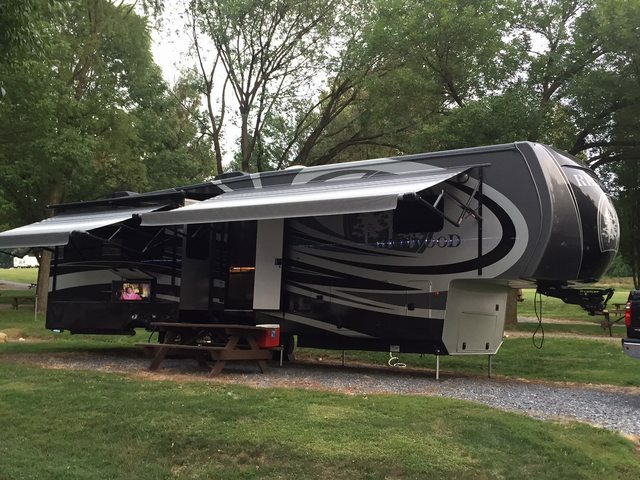 Campground electrical capacity hasn't kept pace with more modern larger RV's that are on the road today. Jim, I run 3 ACs on 50A service all the time, in addition to the dryer, electric hot water, microwave. I have a power management system but it hasn't had to shed a load unless I'm running on generator. Even at a full 15A run for each AC, that's still only 45A against the 100A available on a 50A service. My neighbor said pretty much the same thing Brad said about power usage, since we only stay in 50 amp parks when traveling, he also said you could put a stand alone unit in and put a power source plug outside that would hook up directly to park pedestal, thereby never using RV power. Big concern I guess would be is roof support and running of power supply. Thoughts? Thanks for the input Jim, as always your advice is greatly appreciated, I will have my fill of trying to get this done if I even ever do, right now we use a portable we purchased from HD, works well, but RV doesn't really have room for it as only a couple of windows allow you to vent outside. Thanks again for posting install of Brad's Sat Dish, was very helpful to the installer, gotta love this site. Thanks for feedback Joe, but that's as you say a lotta money. Hi Brad, fella next door to me has three units, says if he ever was at a park with low power (EG) 30 amp service, he would run his generator, along with park power, however he did suggest using a stand alone rooftop unit, snaking a power cord down to basement and putting an outside receptacle to plug a rated extension cord into and then plugging directly into Power Pedestal at campground, this should not use any RV power, allowing everything to work as normal. Concern would be if able to use fan cutout in bathroom, also if roof can be supported to hold unit and how to snake a wire from there to basement. Next major concern would be finding a low profile unit that would not put height above 13 ft 6 ins. Thanks for your input as usual, hope all is well with you and Dory. Hi Greg, thanks for the comeback, I guess it will take some figuring to hopefully work this thing out, if i get a solution or able to pull it off, I will advise.